Our pups have been troopers through all of our travels so far and we figure they deserve some love in this blog. They are Kirby, a handsome little boy with a bit of a Napoleon complex, and Maxwell, who we should have named Kramer. 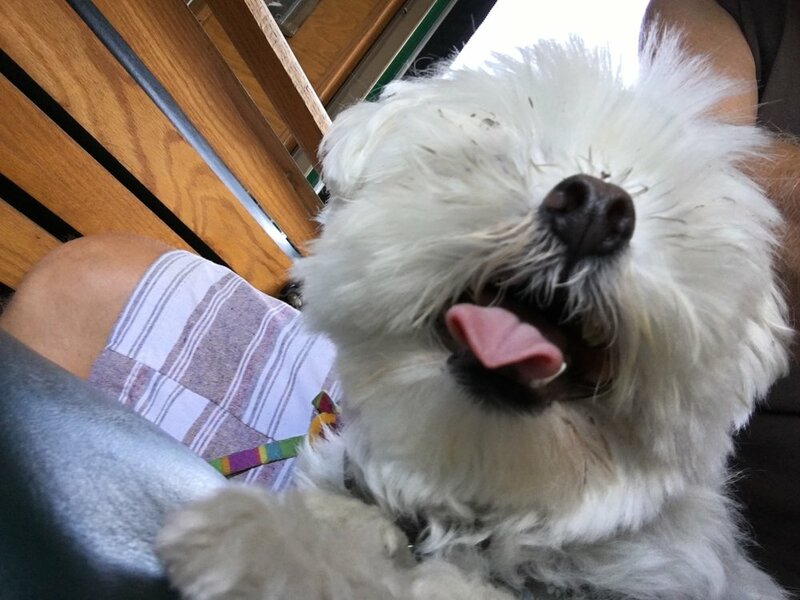 They are both Maltese - Kirby is a better example of the breed but Maxwell has his own unique cuteness. Kirby: We're at the beach! Maxwell: What's a beach? Also, what's that big dark thing behind us? They were both rescues so they have a history we don't know about but based on their behavior we know it wasn't glorious. They like exciting new things to a limit, but really thrive on routine. 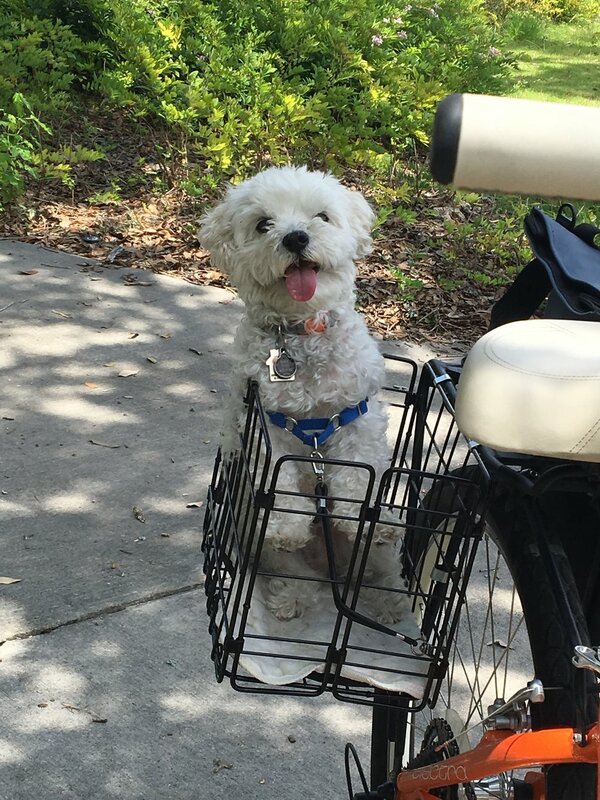 Maxwell just loves to bark during transitions and I think it's because he knows what's about to happen (go to the car, go on a walk, go on a bike ride, that sort of thing). The routine gives him that knowledge and the knowledge gives him a thrill. Kirby knows what's going on too, he just doesn't get loud about it. He's the quiet one and Maxwell is the town crier. Maxwell: Kirby, we're on a boat! Kirby: What's a boat? 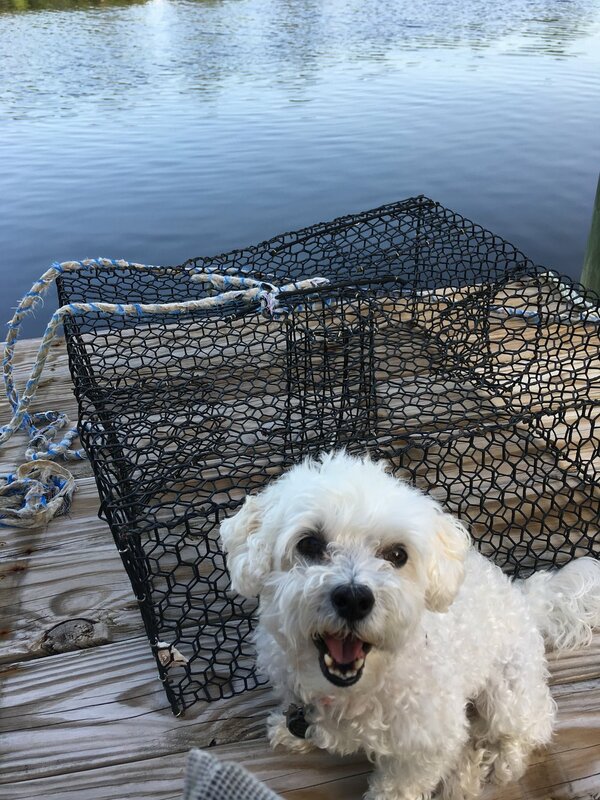 Mommy, are we going to catch some crabs? Also, what're crabs??? The dogs are both 9 years old, which surprises people because of their small size. Dogs weighing 6 and 9 pounds must be puppies, right? They are very dependent on us, especially on Deb who is their “Alpha”, and even though this is normal pack behavior, I think it is boosted some because of their history. The adventures have really all been positive for them. Deb says their life is much better than it was back in our “normal” life. They get to go places much more than they used to, and they love that. At the same time, they seem to be quite happy when we leave them at home to chill together. Like people, they like their down time as well as fun times. For fun, they've been to beaches (4 different ones so far), the pool at Mom's house (many times), on bike rides (many, many times in many different states! 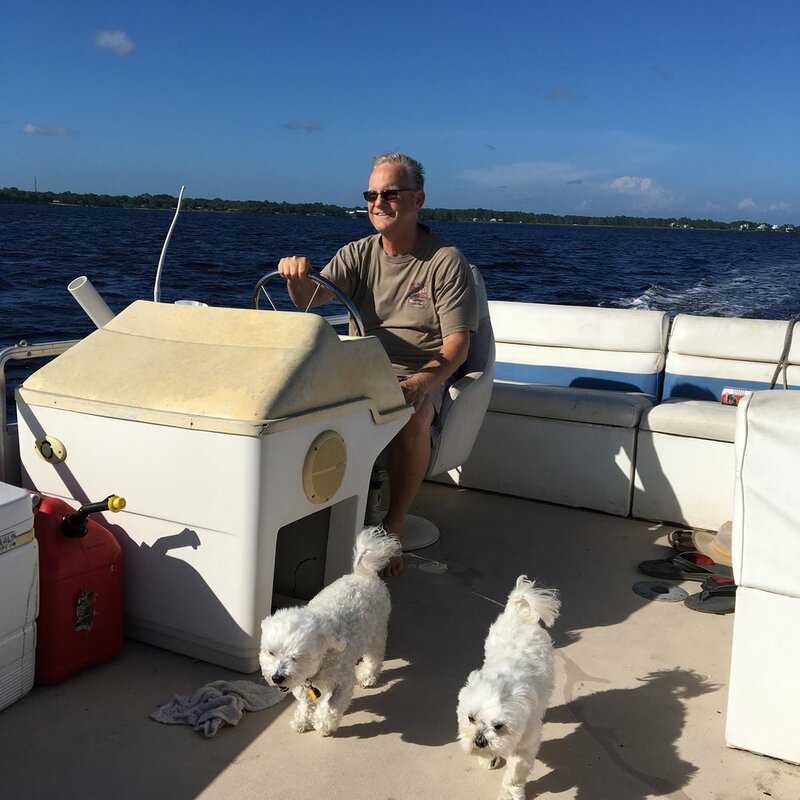 ), to restaurants (quite a few – we seek out dog-friendly places), on my friend Kirby's boat, oh, and also a trolley! They love to explore at each place we stay – Kirby really does this a lot, walking the perimeter of the yard, and wandering off if we let him (but we don't let him!). We call him Dora the Explorer, "Come on Dora, time to come in!". Each time we get to a new place, (we're losing count, but we're well over 10 places we've stayed since May) they have to check it all out in detail, inside and out. And each time we move, they seem to settle in a bit quicker than before. We are careful to bring familiar things, like their chew toys, favorite blankets, that sort of thing. They really appreciate that, you can just tell. B Double-E-Double-R U-N Beer Run! Let's go riding! Many of our pictures of them are on bikes because they are so happy riding! It's always hot out, and the rides give them the cooling breezes, as well as the wonderful new smells and the scenery they wouldn't see otherwise. It sure makes them happy! To be sure, Maltese are not water dogs - they have been bred to be small companion dogs, very attached to their humans. So getting them used to water has been a process, albeit a fun one. In the pool, we each held one of them and slowly descended into the water. 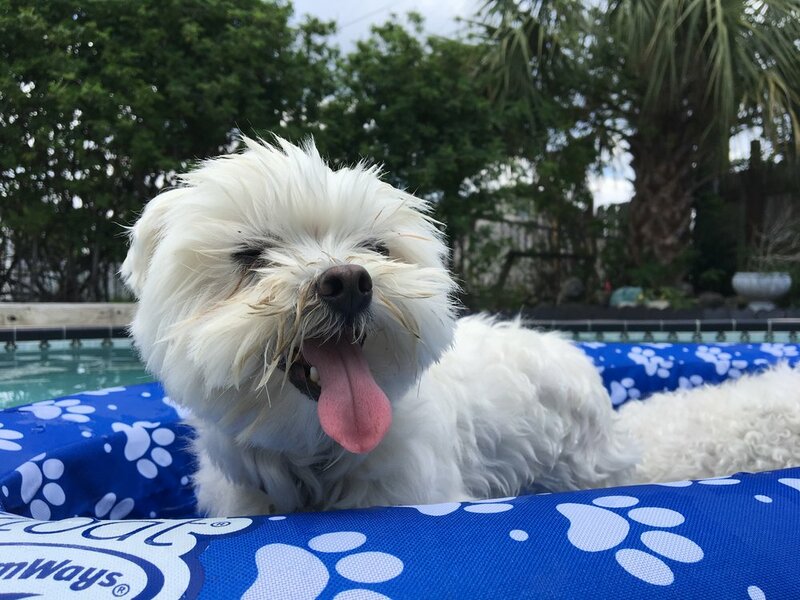 It helped a lot that the pool water felt so good in the heat, they quickly learned that this was going to be OK. Next we introduced a doggie float, it's basically a raft that will stand up to their clawing paws. They really came to like that because they could be wet and cool AND close to their people! We also bought them life jackets but the jury is still out on those. 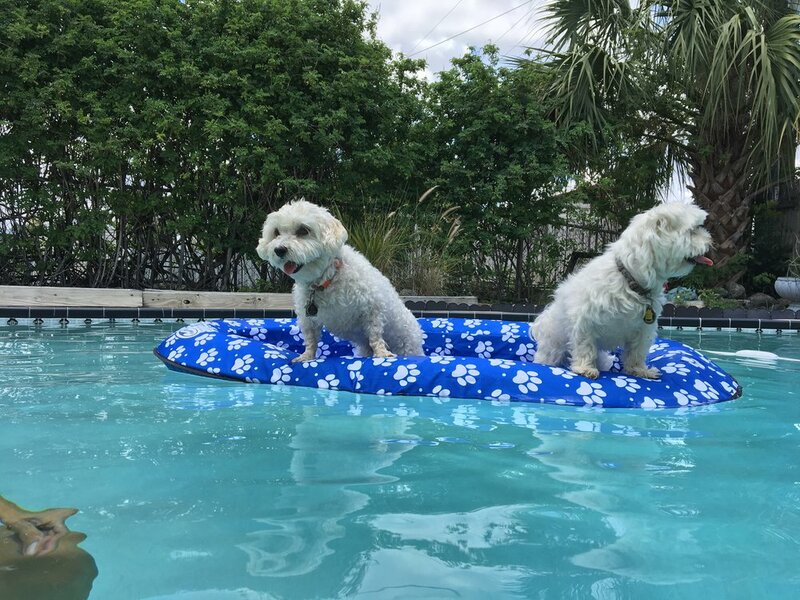 They work just fine, but aren't real "natural" to them, the raft seems to better for them. As for the beach, they love it but are still getting used to the waves. We take them in the water with us, holding them, and it helps if there isn't much in the way of wave action. We dip them to their chests and get them to relax, trying to bob up and down with the waves. They are slowly getting used to that, and we have them to the point where we can release them near the shore to swim a few strokes to the sand. Maxwell really lets us know then, how excited he is to have survived! This picture is in the back of the car, but this is what he does on the sand when he has survived an ocean swim! Yahooooo! 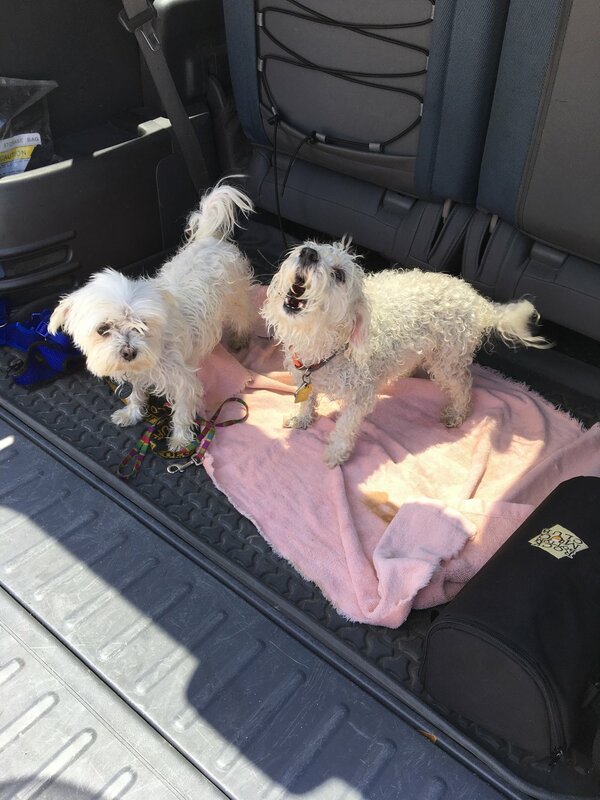 We had just come back from a doggie beach in Venice, FL. 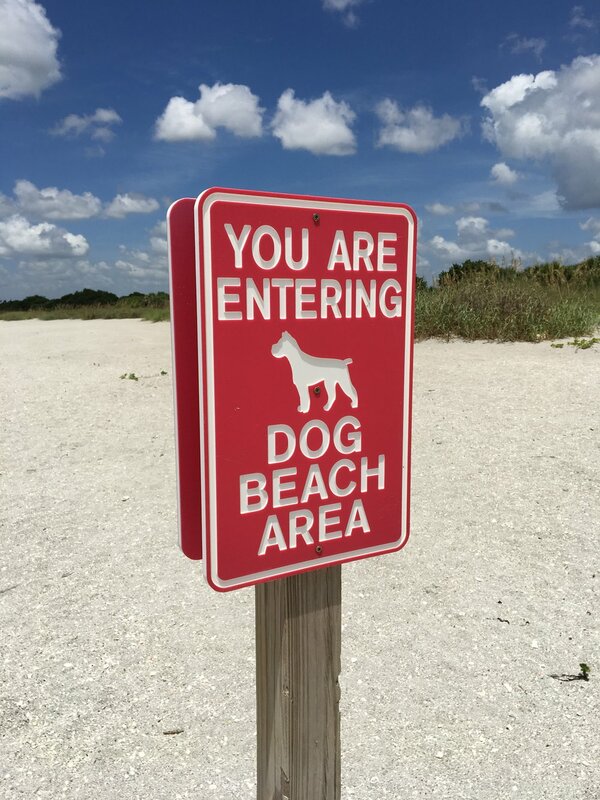 They have a dog park, and then out the back of the park is a dog beach where they can run free. They love running on the beach, especially after a swim! 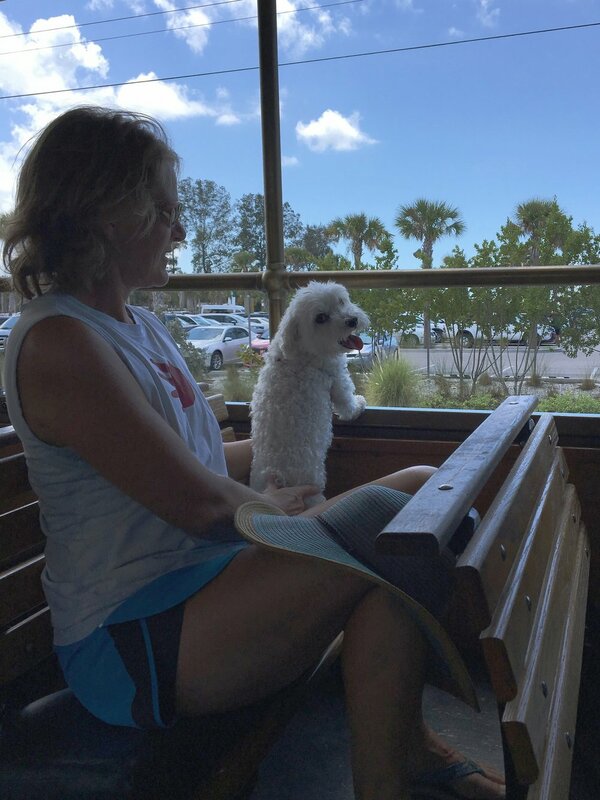 The trolley ride was fun for us all! The front part is air-conditioned but the back has open windows for dogs and humans who just like natural air! It was a great day as we rode down to the restaurant/bar called, what else? The Old Salty Dog! They brought the boys ice water and we had a cold pitcher of beer - everyone was happy! Followed of course by a trolley ride back to our stop and a short walk across the bridge back "home". So, fear not - the dogs are being treated well and are loving their new lives! They can't wait for the next adventure that awaits just around the bend. 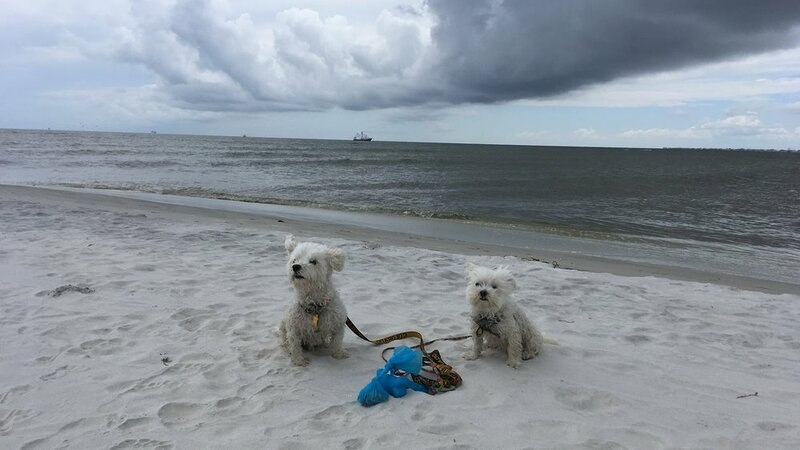 UPDATE August 22: Return to the Dog Beach! We had a chance to go back to the dog beach in Venice! It's out the back of the dog park, down a boardwalk and right onto the hot sand. It's right next to the local airport and there were several light aircraft (small Cessnas etc.) landing over the beach. It's not exactly the famous beach in St. Maarten but they do come in low, pretty neat to see. As for the dogs, we saw a French Bulldog, an Australian Shepherd puppy, a Jack Russell terrier, a Rottweiler, a German Shepherd, a Yellow Lab, and a Springer Spaniel. All were free to run but most of them were in good control and nobody got out of hand. We've been training the dogs to like the water, or at least not be too afraid of it, and we're making great strides! When we set our stuff down near the water, Kirby immediately walked over and plopped down to cool his body in the washing waves! This was a breakthrough! He used to not like the approaching foam line, the edge of the incoming water, and we had to get him to jump over it. He seems to be OK with that now! 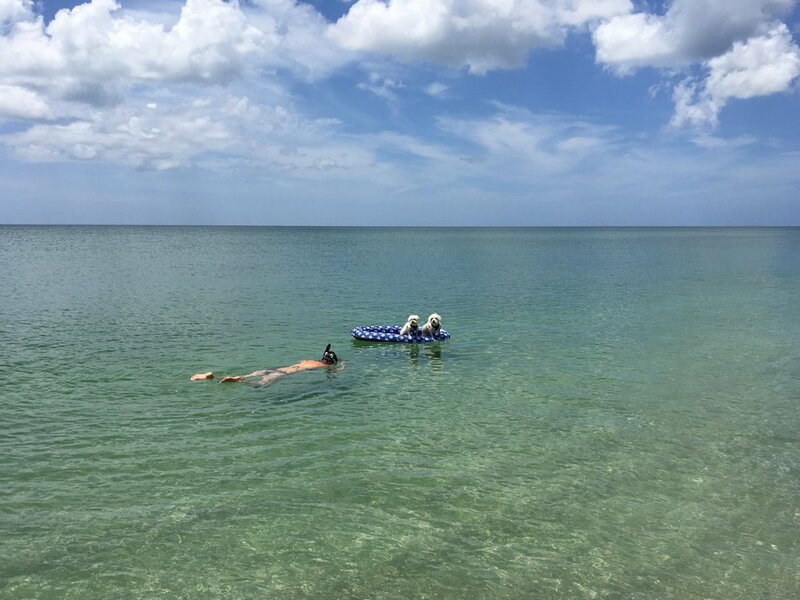 One of the things we've been working toward is going snorkeling with the dogs. The idea is to bring them along in their raft and let them chill above the water while we go below. This was our first chance to try this after all the time in the swimming pool and it worked out great! We had a short leash tied from wrist to the raft and were able to pull them around. I want to get a much longer line, but this is going to work out well! 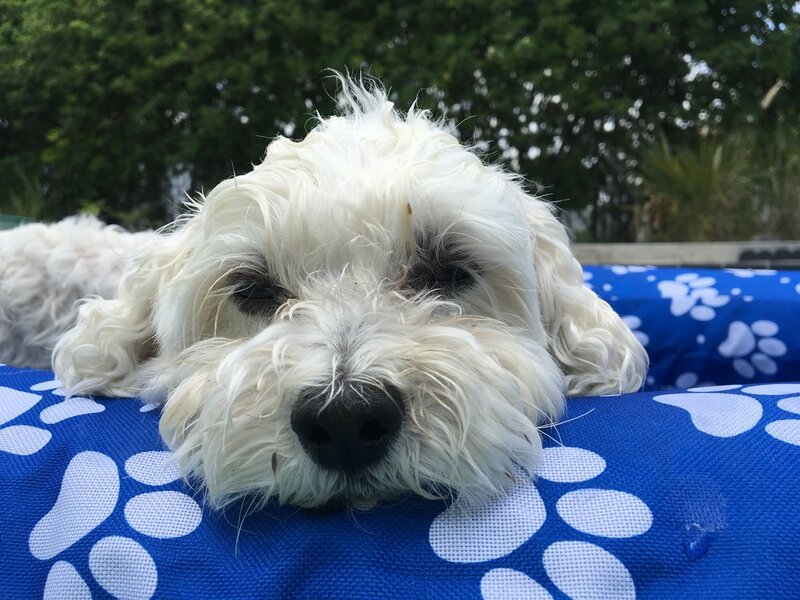 Later, Maxwell actually swam to the raft from shore, only about 10 or 12 feet but that's a big deal for a little dog!, and he climbed on in! He was motivated to get closer to Deb, but I don't care, it's another great milestone. These guys will be water dogs if this keeps up, yay! 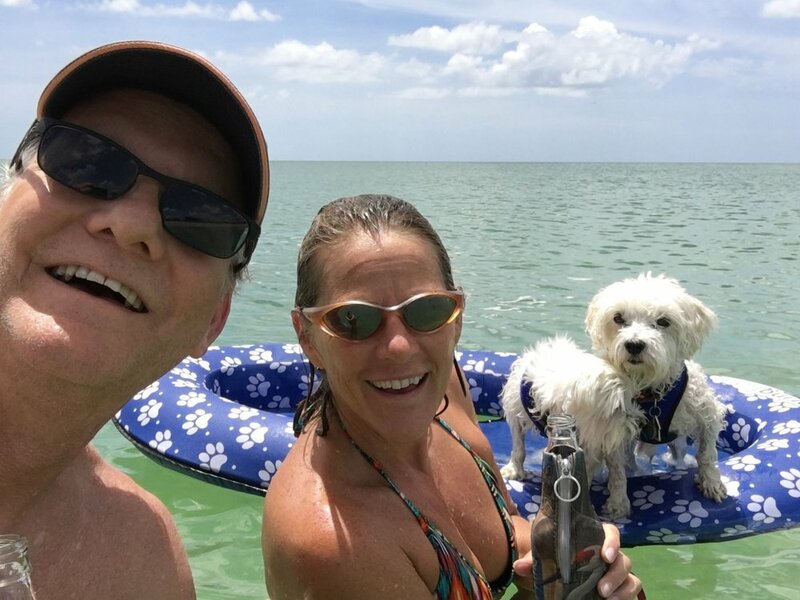 Family time in the water. That's it for now, woof woof! Ah, you’re going to get ALOT of comments from dog lovers. I envy the dogs. The best part about it is: what’s good for them is good for you. Bike rides, walks, fresh air, beaches – these dogs will live a long time. They don’t care where you are, so long as you guys are there. Our next dog (after our 14 yr old 70lb boxador "Kiwi" will hopefully fit in a bike basket. That looks way fun. Casey, I love your comments, thanks for really jumping in! Wow, you have a 14 yr old big dog? Not to be morbid, but he/she is on borrowed time, so enjoy that time, all of you! We saw a wonderful sight on the dog beach, a young lady with a very old yellow lab. 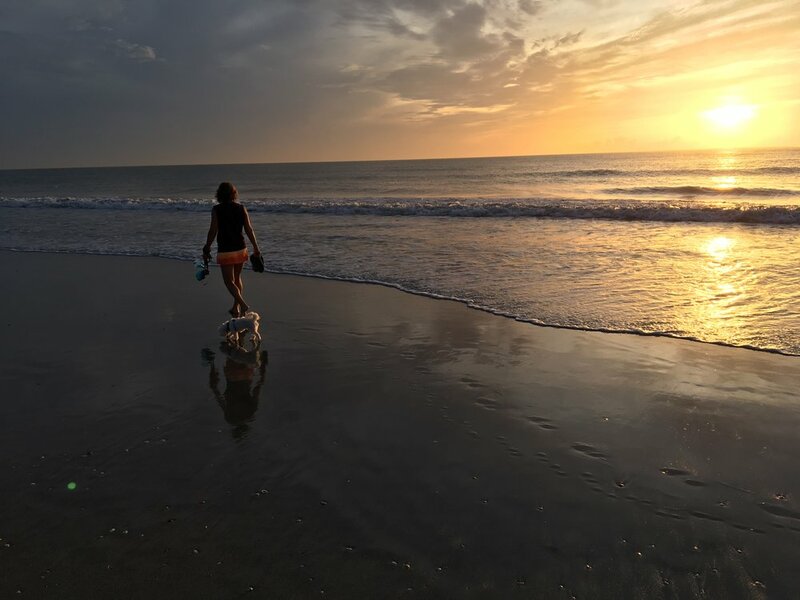 She took him swimming, it was beautiful to see, but afterward he struggled to get back up the beach. She was very patient and helped him, worked with him until he had the strength to make it. I told the old guy to hang in there, he definitely had a great human companion. Little dogs are definitely easier to travel with but at nine, they too only have a few more years. We’ll cherish all of them. Snoop made it to 17, and he was 95 lbs… Of course hounds have pretty slow internal clocks. Wow! Way to go Snoop! 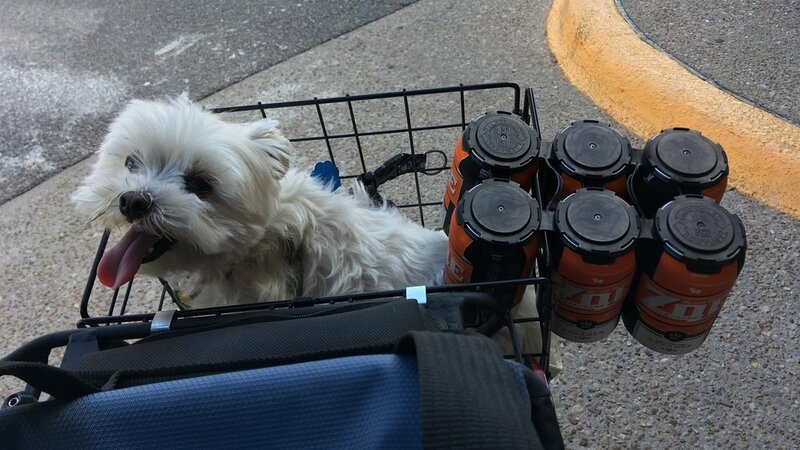 One more thing: what IS that beer in the bike basket? Strange packaging. It was Zoe http://www.hopsandgrain.com/beers/the-one-they-call-zoe-pale-lager/ and was very nice! Are you seeing the plastic six-pack holders? They are becoming pretty common. They are better for the natural environment – no sea turtles becoming entrapped by six-pack rings, and I want to say these are biodegradable, but maybe just recyclable.